June Carter was born in the rugged mountains of Maces Springs, Virginia, to Ezra and Maybelle Carter, pioneers of country music. On stage from a very young age, June found her niche in the spotlight with her vivacious personality and down-home sense of humor. Her confidence and spirit were what attracted Johnny Cash to her in the late 1950s. On the road together, they quickly bonded. June was his helpmate and closest companion. They were married for forty years, through addiction and success, tragedy and triumph. 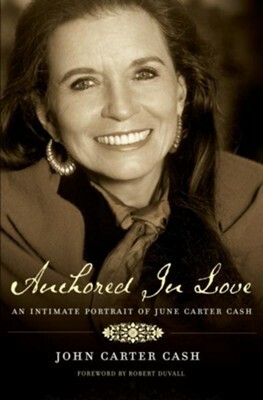 Anchored in Love is an inside look into the life of June Carter Cash, through the eyes of her only child with Johnny Cash-John Carter Cash. With skillful prose, he reveals new information about the legendary woman through his tender memories and heartwarming stories. John Carter Cash is a five-time Grammy-winning record producer and author of numerous articles published in popular newspapers and magazines. He owns and manages Cash Cabin Studio. John Carter diligently preserves the family legacy and is the only child of June Carter and Johnny Cash. He lives with his family in Hendersonville, Tennessee. I'm the author/artist and I want to review Anchored In Love: An Intimate Portrait of June Carter Cash - eBook.